Glass is a product of the supercooling of a melted liquid mixture consisting primarily of sand (silicon dioxide) and soda ash (sodium carbonate) to a rigid condition, in which the supercooled material does not crystallize and retains the organization and internal structure of the melted liquid. When waste glass is crushed to sandlike particle sizes, similar to those of natural sand, it exhibits properties of an aggregate material. Over the past decade, there have been widespread efforts to recover postconsumer glass. Bottle bill legislation, which provides for deposits during purchase of containers and deposit bottle returns at retail outlets, has been introduced in some states, but more often glass recovery and recycling have been attempted through the collection of waste glass at recycling centers or Material Recovery Facilities (MRFs). MRFs are facilities that are designed to sort, store, and market municipal solid waste recyclables that are collected at the curb (source-separated materials). Curbside separation of glass involves homeowner or apartment dweller separation of container glass (or glass commingled with other recyclables such as ferrous and aluminum cans and plastic containers) in preparation for the transport of these materials to the MRF. Some communities that do not have curbside collection offer waste glass drop-off locations for collection. At most MRFs, waste glass is hand-sorted by color (white, amber, and green), and crushed for size reduction (generally to less than 50 mm (2 in) in size). Crushed (color-sorted) glass, which is commonly referred to as cullet, is marketed in most locales as a raw material for use in the manufacture of new glass containers. Traditionally, glass recycling has involved the collection and sorting of glass by color for use in the manufacture of new glass containers. Recycling postconsumer glass from the municipal solid waste stream for use as a raw material in new glass products is limited, however, by the high cost of collection and processing (hand sorting) of waste glass,(2,3) and specifications that limit impurities (e.g., ceramics, ferrous metal, paper, plastics and mixed-colored cullet) in the glass production process. In addition, during collection and handling of glass, high percentages of glass breakage (30 to 60 percent)(4) limit the quantity of glass that can actually be recovered using hand-sorting practices. Given these limitations, traditional glass recycling rates have been relatively low. Figure 1 provides a schematic representation of the flow of container glass in the United States along with potential recycling options. In most cases, mixed-colored waste glass can be obtained by contacting the municipality that is responsible for the collection of recyclables or the MRF operator. The quality of waste glass obtained from MRFs, which collect and process glass from municipal recycling collection districts, can vary widely and can contain dirt, paper, and plastics. Glass gradation can also vary widely. It can range in top size from 25 mm (1 in) to 100 mm (4 in). The exact physical characteristics of the glass from any given source will depend on the processing equipment (e.g., crushing and screening equipment) at the MRF and the degree of processing afforded the mixed colored glass. Waste glass has been used in highway construction as an aggregate substitute in asphalt paving. Many communities have recently incorporated glass into their roadway specifications, which could help to encourage greater use of the material. Crushed glass or cullet, if properly sized and processed, can exhibit characteristics similar to that of a gravel or sand. As a result, it should also be suitable for use as a road base or fill material. When used in construction applications, glass must be crushed and screened to produce an appropriate design gradation. Glass crushing equipment normally used to produce a cullet is similar to rock crushing equipment (e.g., hammermills, rotating breaker bars, rotating drum and breaker plate, impact crushers). (4) Because MRF glass crushing equipment has been primarily designed to reduce the size or densify the cullet for transportation purposes and for use as a glass production feedstock material, the crushing equipment used in MRFs is typically smaller and uses less energy than conventional aggregate or rock crushing equipment. Successful production of glass aggregate using recycled asphalt pavement (RAP) processing equipment (crushers and screens) has been reported. (3) Magnetic separation and air classification may also be required to remove any residual ferrous materials or paper still mixed in with the cullet. Due to the relatively low glass-generation rates from small communities, stockpiles of sufficient size need to be accumulated to provide a consistent supply of material in order for glass use to be practical in pavement construction applications. Crushed glass (cullet) particles are generally angular in shape and can contain some flat and elongated particles. The degree of angularity and the quantity of flat and elongated particles depend on the degree of processing (i.e., crushing). Smaller particles, resulting from extra crushing, will exhibit somewhat less angularity and reduced quantities of flat and elongated particles. Proper crushing can virtually eliminate sharp edges and the corresponding safety hazards associated with manual handling of the product. Table 1. Selected physical properties of waste glass. a. Coarse and Fine glass samples represent minus 19 mm (3/4-in) and minus 6.4 mm (1/4-in) samples, respectively, collected from several MRF facilities unless otherwise indicated. b. Coarse specific gravity samples represent glass fraction greater than 4.75 mm (No. 4 sieve); fine samples represent glass fraction less than 4.75 mm (No. 4 sieve). c. ASTM D854 and C127 procedures were used for the coarse and fine fractions, respectively. Glass collected from MRF facilities can be expected to exhibit a specific gravity of approximately 2.5. The degree of variability in this value depends on the degree of sample contamination and is reflected in the range of specific gravity data shown in Table 1. Crushed glass, which exhibits coefficients of permeability ranging from 10-1 to 10-2 cm/sec, is a highly permeable material, similar to a coarse sand. The actual coefficient of permeability depends on the gradation of the glass, which, in turn, depends on the degree of processing (crushing and screening) to which the glass is subjected. a. Represents waste cullet collected from a City of New York MRF in 1993. Glass-formers are those elements that can be converted into glass when combined with oxygen. Silicon dioxide (SiO2), used in the form of sand, is by far the most common glass-former. Common glass contains about 70 percent SiO2. Soda ash (anhydrous sodium carbonate, Na2CO3) acts as a fluxing agent in the melt. It lowers the melting point and the viscosity of the formed glass, releases carbon dioxide, and helps stir the melt. Other additives are also introduced into glass to achieve specific properties. For example, either limestone or dolomite are sometimes used in lieu of soda ash. Alumina, lead, and cadmium are used to increase the strength of the glass and increase resistance to chemical attack. Various iron compounds, chromium compounds, carbon, and sulfur are used as coloring agents. Most glass bottles and window glass are made from soda-lime glass, which accounts for approximately 90 percent of the glass produced in the United States. Lead-alkali-silicate glasses are used in the manufacture of lightbulbs, neon signs, and crystal and optical glassware. Borosilicate glasses, which have extraordinary chemical resistance and high temperature softening points are used in the manufacture of cooking and laboratory ware. (6) Table 3 lists the typical chemical compositions of these glasses. Table 3. Typical chemical composition of glass types. a. Higher levels for amber-colored glass. b. Only present in green glass. Typical mechanical properties for glass are listed in Table 4. (2) Glass is a brittle material that fractures from tensile stress. Gravel-sized glass particles that are greater than 4.75 mm (No. 4 sieve) in size exhibit relatively poor durability when compared with conventional aggregate materials. The internal friction angle or shear strength and the bearing capacity of crushed glass blended with conventional aggregates is relatively high, and its compactibility is relatively insensitive to moisture content. Due to its vitreous, inert nature, crushed glass can be expected to exhibit good soundness properties, but poor frictional properties. Typical mechanical properties if waste glass are shown in Table 4. Table 4. Typical mechanical properties of waste glass. Glass is known for its insulating or heat-retention properties (low thermal conductivity). Aggregates and aggregate mixtures with low thermal conductivity can help to decrease the depth of frost penetration. Studies conducted at the Colorado School of Mines in the early 1970's reported that glass aggregate pavements take a longer time to cool down due in part to the lower thermal conductivity of glass, when compared to natural aggregates. (11) Recent thermal conductivity test results (ASTM C518) for mixed-colored crushed glass are presented in Table 5. (2) Comparison of the results for crushed glass with those for a natural gravelly sand aggregate mix show that glass can be expected to exhibit higher heat retention than natural aggregate materials. Table 5. Thermal conductivity test results. 1. Results are presented for two separate samples. The high reflective properties of glass can be a desirable property in highway construction if they assist in delineating the roadway surface from the surrounding environs. Excessive reflection could, however, result in glare that could adversely affect roadway visibility. There are no documented studies on the quantities of size fractions of glass in pavements that are likely to produce excessive glare. There is, however, a noticeable glass reflection in pavements with glass fractions exceeding 15 percent by weight. EPA. Characterization of Municipal Solid Waste in the United States: 1995 Update, EPA 530-R-96-001, March 1996. Washington State Department of Trade and Economic Development, Glass Feedstock Evaluation Project, 1993. Chesner, W. H. and Petrarca, R. W. "The Ecosphere Recycling System and the Use of Glass as a Construction Aggregate Material,"Proceedings of the 1988 Conference on Solid Waste Management and Materials Policy. Legislative Commission on Solid Waste, New York State, January 1988. Egosi, N. G. "Mixed Broken Glass Processing Solutions," Utilization of Waste Materials in Civil Engineering Construction. Editors H. Inyang and K. Bergeson, American Society of Civil Engineers, 1992. Chesner, W. H. "Waste Glass and Sludge for Use in Asphalt Pavement," Utilization of Waste Materials in Civil Engineering Construction. Editors: H. Inyang and K. Bergeson, American Society of Civil Engineers, 1992. Samtur, H. Glass Recycling and Reuse, University of Wisconsin, National Science Foundation, NTIS PB239674, March 1974. Ahmed, I. Use of Waste Materials in Highway Construction, Purdue University, FHWA/INJHRP-91/3, January 1991. Phillips, J. C., D. S. Cahn, and G. W. Keller. "Refuse Glass Aggregate in Portland Cement Concrete," Proceedings of the Third Mineral Waste Utilization Symposium, U.S. Bureau of Mines, Chicago, Illinois, March 1972. Johnston, C. D. "Waste Glass as Coarse Aggregate for Concrete." American Society for Testing Materials, Journal of Testing and Evaluation, Vol. 2, No. 5, 1974. Duckett, E. J. Cullet from Municipal Waste, Ceramic Industry, April 1979. Dickson, P. "Cold Weather Paving with Glassphalt," Albuquerque Symposium on Utilization of Waste Glass in Secondary Products, 1973. Waste glass that is crushed and screened can be used as a portion of fine aggregate in asphalt paving mixes. Satisfactory performance has been obtained from hot mix asphalt pavements incorporating 10 to 15 percent crushed glass in wearing surface mixes. The term "glasphalt" has at times been used to describe these pavements. Higher blends, incorporating perhaps up to 25 percent, could potentially be used in base or binder course mixes. Hot mix asphalt surface course pavements with more than 15 percent waste glass may experience deterioration due to stripping of the asphalt cement binder from the waste glass. At the present time, the commercial use of waste glass in asphalt paving applications has been limited to communities such as the City of New York, where the quantity of waste glass produced and collected provides sufficient incentive to recycle it in pavement applications. Most of the earlier applications of glass use have been limited to test pavements or specialty applications. Flat and elongated particles that could contribute to pavement raveling, stripping, poor skid resistance, abnormally high tire wear, and excessive glare were all identified by early researchers as potential problems. Since glass does not absorb any of the asphalt cement binder, and since glass is also "hydrophilic," moisture damage (stripping) is a particular concern that has been identified, especially when high percentages and large gradations are introduced into a surface course mix. (9) Many of the early investigators recommended the addition of lime as an antistripping agent to reduce potential stripping problems. Early glasphalt projects used high percentages of glass (greater than 25 percent by weight of the mix) with coarse glass gradations (greater than 12.7 mm (1/2 in)). Current data suggest that the use of high glass percentages and large particles of glass probably contributed to most of the stripping and raveling problems that were reported during the early test pavement demonstrations of the 1960's and 1970's. When used in asphalt concrete, glass processing must include the removal of ferrous and nonferrous metal, plastic, and paper. In most waste glass processing plants this requires screening, magnetic and eddy metal current (non-ferrous metal) separation, air classification, and/or handpicking operations. Although 100-percent removal of all paper, plastic, and debris from postconsumer glass streams is unlikely, an acceptable glass product can be achieved in most instances, particularly if mix designs limit glass to 10 to 15 percent of the mix. Crushing and screening are required to achieve proper sizing and to eliminate flat and/or elongated and sharp-edged glass particles. Some of the glass properties that are of particular interest when glass is used as fine aggregate in asphalt paving include gradation, specific gravity, and durability. Gradation: Waste glass used in asphalt surface pavements should be processed to a fine aggregate size (less than 4.75 mm (No. 4 sieve) and blended with conventional aggregates to conform to gradation requirements in accordance with AASHTO T27. (11) Larger top sizes ranging from 9.5 mm to 15.3 mm (3/8 to 5/8 in) should be suitable for use in base course mixes. 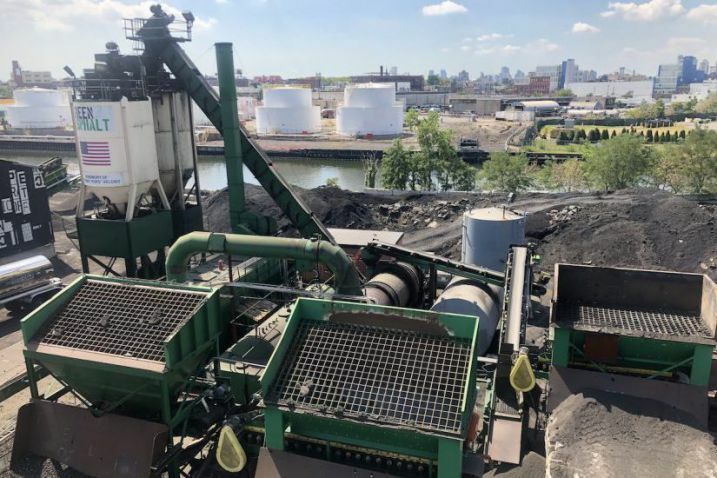 Specific Gravity: Due to a specific gravity approximately 10 to 15 percent below conventional aggregates, waste glass can be expected to provide a greater yield (more volume of asphalt concrete per ton). Durability: Glass is a brittle material and coarse particles greater than 4.75 mm (3/8 in) in size can be expected to break down during handling. Consequently, it is preferable to process (crush and screen) waste glass into a fine aggregate size, which is minus 4.75 mm (No. 4 sieve), prior to its use in surface course asphalt paving mixes. Some of the properties of an asphalt mix containing glass that are of particular interest include frictional properties, mix stability, stripping resistance, and reflectivity. Frictional Properties: Skid resistance tests results that have been reported have shown waste glass pavements to fall within recommended skid resistance testing limits. Nonetheless, large glass particles (greater than 19 mm (3/4 in) in size) that have at times been incorporated into poorly processed surface course pavements could become slick when wet and should be avoided in all surface mixes containing glass. Mix Stability: The angular shape and high friction angle (approximately 50°) of well-crushed glass contributes to good lateral stability. This is a positive feature, particularly where vehicular braking and acceleration are considerations. Reflectivity: Large percentages of glass in a surface pavement (greater than 15 percent by weight) produce a noticeable increase in the reflectivity of the pavement. Depending on the size of the glass particles, this could produce a noticeable glare, particularly on wet pavements. Smaller glass particles and lower percentages of glass can help to reduce reflective glare problems. Most data at the present time indicate that larger gravel-sized glass particles will reduce pavement performance, and that optimum performance can best be achieved by using crushed glass as a sand or fine aggregate substitute (less than 4.75 mm, or No. 4 size sieve). When waste glass is used as a fine aggregate substitute material, glass performance in hot mix asphalt should be comparable to conventional mixes. (14) Where larger, gravel-sized glass particles are used, raveling and stripping in particular could be a problem. The introduction of an antistripping agent such as hydrated lime (approximately 2 percent by weight of aggregate) could be beneficial, but performance should be satisfactory if only fine-grained (minus 4.75 mm (No. 4 sieve) glass is used and substitution rates do not exceed 15 percent. Conventional AASHTO pavement structural design methods are appropriate for asphalt pavements incorporating waste glass in the mix. The same methods and equipment used to store or stockpile conventional aggregates are applicable for waste glass, particularly where glass is properly precrushed to a fine, sand-size fraction, where additional breakdown is not a concern. The same methods and equipment used for conventional pavements are applicable to asphalt pavements containing waste glass. The development of uniform specifications concerning sizing, levels of debris and mix limitations are needed to facilitate glass use. There is some uncertainty regarding the need for antistripping agents such as lime if glass is reduced to a very fine aggregate size (less than 6.35 mm (1/4 in)). The most limiting constraint to glass use is the lack of an adequate and consistent supply of the product. In only a few instances, such as in the City of New York, have provisions been made to establish a continuous market supply of glass. The elimination of hand sorting and crushing of all glass to produce a market-ready aggregate product is probably required to achieve more widespread glass use. Leite, B. J. and D. D. Young. Use of Waste Glass as Aggregate for Pavement Material, Department of Engineering and Construction, City of Toledo, Ohio, 1971. Abrahams, John H., Jr. "Recycling Container Glass -- An Overview," Proceedings of Third Mineral Waste Utilization Symposium, Chicago, Illinois, 1972. Molisch, W. R., T. E. Keith, D. E. Day, and B. G. Wixson. "Effects of Contaminants in Recycled Glass Utilized in Glasphalt," University of Missouri - Rolla, Proceedings of the Third Mineral Waste Utilization Symposium, Chicago, Illinois, 1972. Abrahams, J. "Road Surfacing with Glass Aggregate," Albuquerque Symposium on Utilization of Waste Glass in Secondary Products, 1973. Molisch, W. R., et al. Use of Domestic Waste Glass for Urban Paving,, University of Missouri -- Rolla, 1975. Samtur, H. Glass Recycling and Reuse, IES Report No. 17, University of Wisconsin-Madison, 1974. Chesner, W. and R. Petrarca. Report on Glass Aggregate Pavement for the Browning Ferris Industries' Merrick Transfer Station Located in Hempstead, New York, August 1987. Slater, William, New York City Hamilton Avenue Asphalt Plant Manager, Telephone Communication, November 1995. Flynn, Larry. "Glasphalt Utilization Dependent on Availability." Roads and Bridges, February 1993. Petrarca, R. "Use of Glasphalt," Paper Presented to the Long Island Society of Asphalt Technologists, 1988. American Association of State Highway and Transportation Officials. Standard Specification for Materials, "Fine Aggregate for Bituminous Paving Mixtures," AASHTO Designation: M29-83, Part I Specifications, 14th Edition, 1986. Chesner, W. "Waste Glass and Sewage Sludge Ash Use in Asphalt Pavement," Utilization of Waste Materials in Civil Engineering Construction. American Society of Civil Engineering. 1992. American Society for Testing and Materials, Standard Specification D2950-96, "Density of Bituminous Concrete in Place by Nuclear Methods,"Annual Book of ASTM Standards, Volume 04.03, West Conshohocken, Pennsylvania, 1996. Waste glass that has been crushed and screened has the potential for use as a granular base material. Glass that has been reduced to a fine aggregate size fraction (less than 4.75 mm (No. 4 sieve) in size) exhibits properties similar to that of a fine aggregate or sandy material, with relative high stability, due to the angular nature of crushed glass particles. Blending with other coarse conventional materials will typically be required to meet required granular base gradation specifications. Waste glass should be free of ferrous and nonferrous metal, and the level of inorganic and organic debris should be reduced as much as practical. It has been recommended that levels of debris in the waste glass should be limited to 5 percent as determined by the American Geophysical Institute (AGI) test method. (3) The AGI test method is a visual test in which small samples are placed on a grid and extraneous debris counted and measured by weight. Some of the properties of waste glass that are of particular interest when glass is used in granular base applications include gradation, density, friction angle, bearing capacity, durability, and drainage characteristics. Unit Weight and Compacted Density: Crushed glass has a unit weight of approximately 1120 kg/m3 (70 lb/ft3), which is lower than that of conventional aggregate. The compacted density of crushed glass will vary with the size and grading of the glass as well as the degree of contamination (extraneous debris, such as paper, plastic caps, and soil). A maximum dry density of approximately 1800 to 1900 kg/m3 (111 to 118 lb/ft3) has been reported, which is also somewhat lower than that of conventional granular material. Crushed glass exhibits a relatively flat moisture-density curve, which indicates that the compacted density is insensitive to moisture content. Durability: Larger size glass particles have marginal durability, as measured by the Los Angeles Abrasion test, with values of approximately 40 to 45 percent. This suggests that additional processing (crushing) of the waste glass would be desirable to eliminate the larger, less durable glass fraction. Drainage: Crushed glass is a free-draining material that exhibits permeabilities ranging from 10-1 to 10-2 cm/sec, depending on the glass gradation. Maximum dry density of cullet-aggregate mixes should be determined by the Modified Proctor Test, ASTM D1557. Debris levels should be limited to 5 percent as determined by the American Geophysical Institute visual method(3) to ensure the use of a clean material. Conventional AASHTO pavement structural design procedures can be employed for granular base containing waste glass. The same general methods and equipment used to handle conventional aggregates are applicable for waste glass. When combined with natural aggregates, crushed glass should be uniformly mixed. The same methods and equipment used to place and compact conventional aggregate can be used to place and compact waste glass. 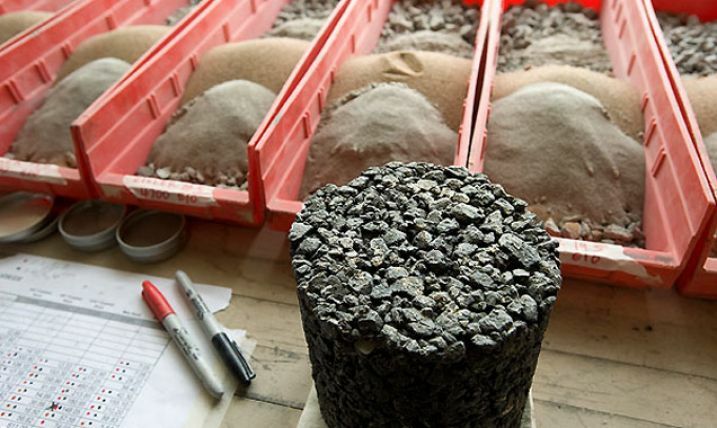 The same field test procedures used for conventional aggregate are recommended for granular base applications when using waste glass. Standard laboratory and field test methods for compacted density are given by AASHTO T191(5), T205(6), T238(7), and T239(8). Monitored field demonstration programs should be undertaken to better document the performance of granular glass bases in actual applications. Field density test methods, using the nuclear gage density test, require verification. American Geophysical Institute. AGI Data Sheet 15.1 and 15.2, Comparison Chart for Estimating Percent Composition, 1982.